What a perfect day it has been to stamp. I have alot of family birthdays in February and March. So today I was able to do the cards I've been planning to make. It is always fun to use a new set of stamps. And now that I have several of the Sale A Bration sets I could spend days at my desk creating. You have about about a month left to get the free sets, one with each 50.00 merchandise purchase. Then they will be gone forever. 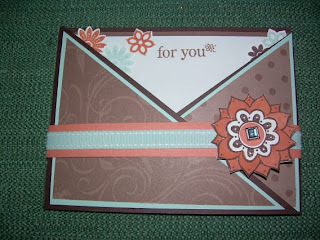 This is a great time to add reinkers and fill in your favorite card stock or add some designer series papers. I hope you have had a great time stamping. If you have questions feel free to contact me with them at barb.harmon@gmail.com.